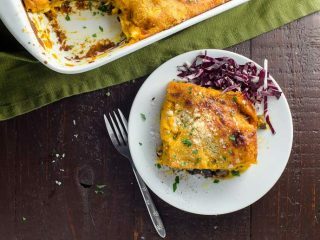 Make your vegetarian Thanksgiving guests feel loved with this satisfying kabocha squash lasagna. It's savory and satisfying and definitely not an afterthought. Kabocha squash has dense, sweet flesh that works wonders in a béchamel sauce. If you can't find it, you can substitute butternut and use less broth than the recipe calls for. 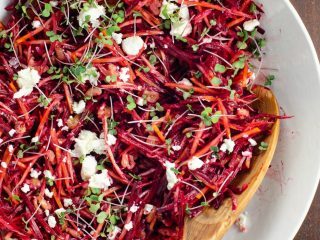 As far as I'm concerned, you can never have too many ways to feed your vegetarian guests on Thanksgiving and throughout the winter holidays. I'm personally kind of a weirdly big fan of making a whole meal out of side dishes — couldn't care less about turkey, but gimme gimme gimme all the stuffing and mashed potatoes and gravy and veggies. But even so, I always try to have a legit main dish to let vegetarians know that they've been considered and respected and loved. 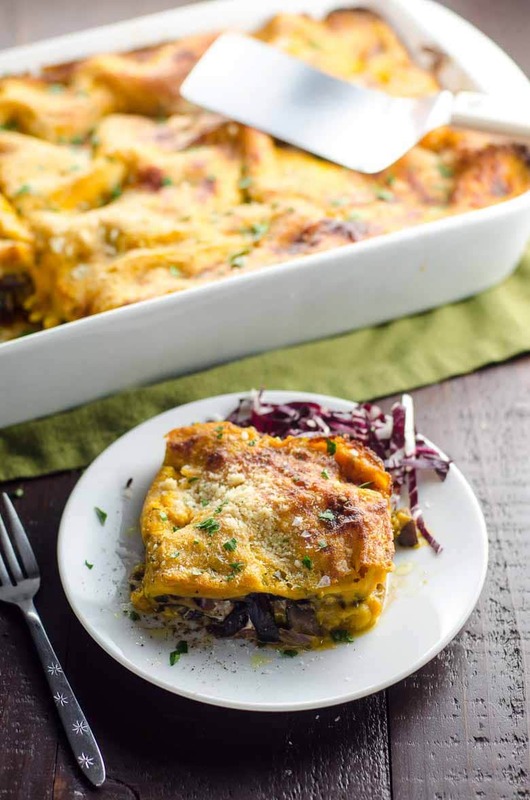 This winter squash lasagna, made with a velvety kabocha squash béchamel sauce and a savory filling of mushrooms and radicchio, really knocks it out of the park. You can fully prepare this dish ahead of time and bake it right before serving, or if oven space is super-tight, you can even bake it ahead of time in a glass baking dish and reheat the whole thing in the microwave. (Just don't tell anyone I said that, okay?) The flavors are full-on autumnal, so your guests should feel free to situate a nice slab of lasagna right alongside their cranberry sauce and gravy swamp and applesauce and what have you. This vegetarian lasagna will make your plant-eating guests feel loved, and the autumnal flavors go well with other Thanksgiving and winter holiday dishes. Kabocha squash has a dense, flavorful flesh that's sweet enough to balance the earthy mushrooms and bitter radicchio in the filling. If you can't find kabocha, you can substitute butternut, but you won't need as much vegetable broth since butternut has a higher water content. Add just enough so that the squash is easy to puree. Preheat oven to 400°F with a rack in the center. Pierce the squash in several places with a small, sharp knife and place in a roasting pan. Bake for about an hour, until flesh is tender enough to insert a fork easily. When cool enough to handle, cut in half. Scoop out and discard seeds and stringy center. 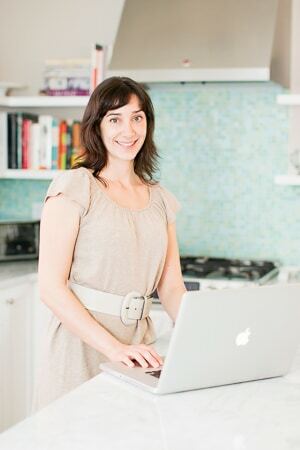 Then scoop the flesh out of the skin and into the bowl of a food processor fitted with the blade. Add broth and puree until smooth, stopping to scrape down sides as necessary. This process should yield somewhere in the neighborhood of 4 cups of squash puree, but don’t stress about it. In a medium pot with a heavy bottom, melt the butter over medium-high heat. Add the thyme and sage and cook for one minute. Whisk in flour and cook for another minute or so, until bubbling substantially. Whisk in milk all at once. Bring to a boil over high heat, then reduce heat and simmer, stirring frequently, for five minutes or so, until slightly thickened. Off the heat, whisk in 1 1/2 teaspoons of the salt along with the nutmeg and cayenne. Then whisk in the squash puree until it all becomes a smooth sauce. Warm the olive oil in a 12-inch nonstick skillet over medium heat. Add onion, mushrooms and garlic along with remaining 1/2 teaspoon salt and cook, stirring occasionally, until mushrooms have reduced in volume by about half. Add radicchio and cook, stirring frequently, until wilted. Off the heat, stir in the balsamic vinegar. Lightly brush a 9x13-inch pan with oil. Place a thin layer of béchamel sauce at the bottom of the pan, followed by a layer of lasagna noodles. Top with half the mozzarella, half the mushroom mixture, 1/3 of remaining béchamel, and 1/4 cup of pecorino. Repeat with another layer of noodles, mozzarella, mushroom mixture, sauce and pecorino. Finally, add one more layer of noodles and top with remaining sauce and pecorino. Bake for about 45 minutes, until lightly browned and bubbly. I've used white button mushrooms, cremini, portobello with the gills scraped out and shiitakes in this recipe over time, and they all work well.